Blizzard is listening, but there an awful lot of people talking at the same time. There's an interesting thread in the World of Warcraft forums, which begins with a complaint about the “absurd gold price on new items” in the game. The poster expresses concern about in-game price hikes, which he says pushes them to a point “that a fraction of the people will be able to afford,” and then asks for feedback on the matter from other players. Stashed among the responses he's received so far is one from Ion Hazzikostas, assistant game director on World of Warcraft, who doesn't actually address the specific issue raised, but instead breaks down some of the complexities involved in receiving, and responding to, feedback in a game as sprawling as WoW. He begins by noting that “it's exceptionally rare that everyone wants the same thing,” despite the common argument that most players want (or don't want) this feature or that. 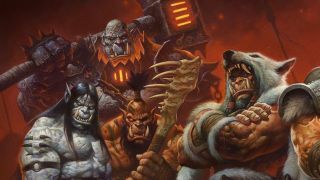 And when there is unanimity, or something approaching it, Blizzard reacts quickly: Hazzikostas cited a change to Group Finder loot shortly after the release of Warlords of Draenor that was reverted within two days, following “overwhelmingly” negative feedback. But the really interesting part comes after that, when he explains that in reality, just about every aspect of World of Warcraft actually caters to a minority of players. Perceiving that minority status is complicated by the fact that people who enjoy a certain style of play tend to congregate with others who are into the same thing, so changes are naturally more likely to impact likeminded groups, amplifying the feeling that the bulk of the player base is unhappy. Furthermore, if Blizzard was to give precedence to a particular group or play style, it would inevitably elevate those players above the actual majority, and there make the game "smaller," Hazzikostas said; conversely, if it aimed at satisfying the majority of players with more across-the-board rewards, the value of those rewards would ultimately be diluted. It's an interesting read, and the conversation goes on for quite a distance past Hazzikostas' post: He jumped in part-way down page four, and the thread currently runs to page nine. Read it in full at Battle.net.